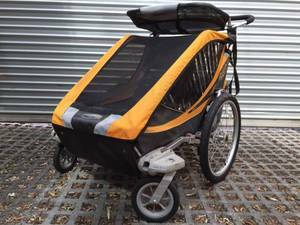 Black and gold Chariot Cougar 2 pram/jogger/bike trailer. This is easily the best toddler purchase we made. Carries one or 2 children up and up to 45kg. Adjustable suspension and really light - very easy to push, tow and pack down. and big shower-proof bag on the back and pockets on the inside. It has a sun visor and rain cover that roll up out of the way. There are reflectors on all sides and a visibility flag that slots into the back corner.